The planetary system harboring Kepler-138 b, the first exoplanet smaller than Earth with both it mass and size measured. All three planets known to orbit the star have been characterized by NASA’s Kepler mission observing their transits, i.e., when the planets pass in front of the star. In this artist’s conception, the sizes of the planets relative to the star have been exaggerated. Kepler-138 b, in the foreground, is likely an airless rocky world. Because of the gravitational forces between the planets, the planets are shifted slightly from the positions that would be expected without their mutual gravitational interactions. This enabled their masses to be measured. Artwork credit: Danielle Futselaar, SETI Institute. A team of astronomers has measured the mass and size of the smallest exoplanet yet, a Mars-sized planet orbiting a red dwarf star about 200 light years from our solar system. The team, which includes astronomers at Penn State University, NASA Ames Research Center, the SETI Institute, and the University of Chicago, describes the achievement in a paper that will be published in the journal Nature on 18 June 2015. The planet, named Kepler-138 b, is the first exoplanet smaller than the Earth to have both its mass and its size measured. It is one of three planets that orbit the star Kepler-138 and that pass in front of it on every orbit as viewed from Earth — a maneuver that astronomers call a transit. “Each time a planet transits the star, it blocks a small fraction of the star’s light, allowing us to measure the size of the planet,” said Dr. Daniel Jontof-Hutter, a research associate in astronomy at Penn State who led the study. “We also measured the gravity of all three planets, using data from NASA’s Kepler mission, by precisely observing the times of each transit,” Jontof-Hutter said. The astronomers also were able to measure the masses of these planets. “Each planet periodically slows down and accelerates ever so slightly from the gravity of its neighboring planets. This slight change in time between transits allowed us to measure the masses of the planets,” Jontof-Hutter explained. After measuring both the mass and size of an exoplanet, astronomers then can calculate its density and its bulk composition. “Current measurements are consistent with a variety of compositions, and favor compositions that are mostly rocky,” according to Dr. Jason Rowe of the SETI Institute, a coauthor of the study. All three planets orbiting Kepler-138 are close to their star and are most likely are too hot to be habitable. The Kepler spacecraft continues to search for planets and to explore the cosmos as part of a new mission, known as K2. 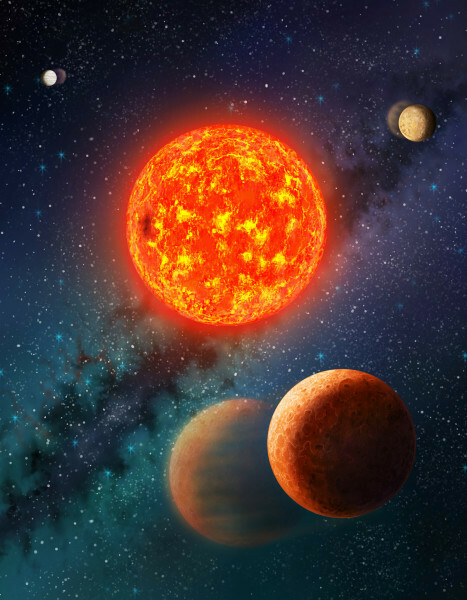 Both K2 and NASA’s upcoming Transiting Exoplanet Survey Satellite missions will hunt for planets transiting brighter stars that will be more easily studied by ground-based observatories such as the Hobby-Eberly Telescope (HET) and the Miniature Exoplanet Radial Velocity Array (MINERVA). Penn State is a partner in both of these planet-hunting observatories. Penn State also is leading in the development the new Habitable Zone Planet Finder instrument, which will be installed at the Hobby-Eberly Telescope in 2016.This research was supported by NASA, the Penn State Center for Exoplanets and Habitable Worlds, the Penn State Department of Astronomy and Astrophysics, the Penn State Eberly College of Science, the Pennsylvania Space Grant Consortium, and the Alfred P. Sloan Foundation.